A fresh take on the stimulating puzzle craze. This interactive brain teaser is designed for long-lasting play, and made with a pliable, Orbee-Tuff® outer shell, and unique inner maze. Stuff with your dog's favorite treat and enjoy! 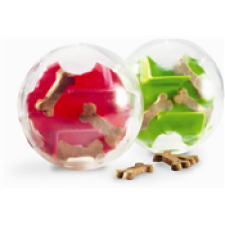 This toy is intended for puzzle-play, not chewing!